Argon/CO2 Flowmeter with Pressure Regulator For TIG MIG Welding. 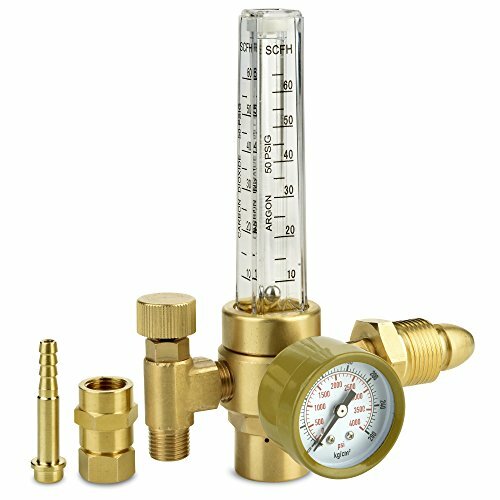 Light Duty Brass Flow Meter For Argon/CO2 and Helium tanks with CGA-580 inlets. ARGON/CO2 REGULATOR FOR WELDING: Terrabloom Argon Gas Flow Meter Regulator is Designed for Professional TIG/MIG Welding Applications. It Provides an Easy and Accurate Way to Adjust Gas Flow Between 10-60 CFH. View More In Pressure Regulators. If you have any questions about this product by TerraBloom, contact us by completing and submitting the form below. If you are looking for a specif part number, please include it with your message. Watts 1156F Feed Water Pressure Regulator, 1/2"
Cash Acme 24463-0045 Pressure Regulator, EB45-U Single Threaded Union Metal Top, 3/4"